I love to see what this quilting group is up to. 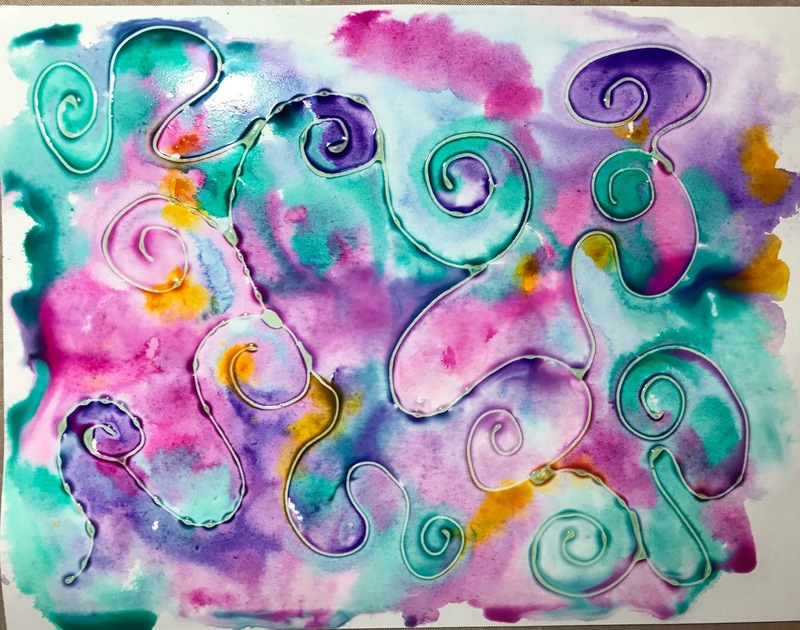 Do you love zentangle, or want to know more about it? 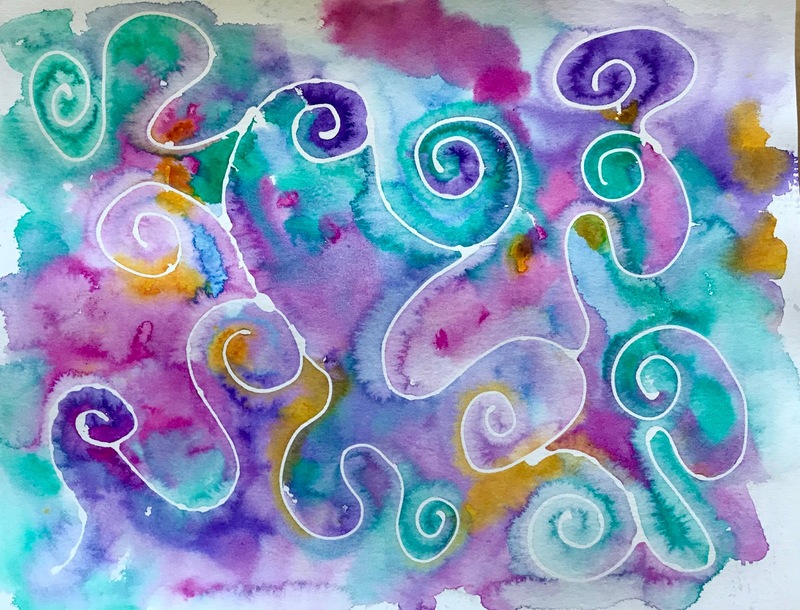 Read this article listing premier zentangle websites. Lost your marbles? Here are some pretty ones. Encouraging children’s sense of wonder through Bible stories. Who’s the father of the To-Do list? The illustrations of Rebecca Thornburgh. Ways that journaling can enhance your life. Truths that would change the way we live—if only we could remember them. And speaking of change, here’s how I feel about it. Longer than most of the videos on ARHtistic License, this documentary on the process of painter Bo Bartlett is worth your time. A great big ARHtistic License thank you to Alice Hendon for this fabulous idea. I’ve ordered my resist pen, and I can’t wait to try this. Check out Alice’s other work at The Creator’s Leaf. Zentangle All Around recently had a prompt to think outside the box. Try something you’ve not done before. A product, a technique, anything that breaks the block we artists all feel at one time or another. Christine called the prompt: Break the Block! Months ago I bought a Prima product called Watercolor Resist Pen. 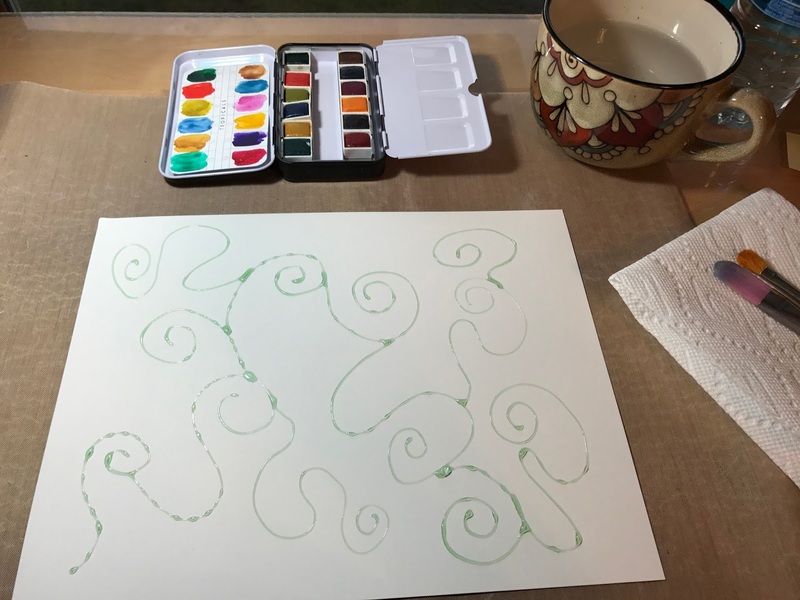 A bottle of liquid that allows you to mask off an area so you can have contrast when you watercolor. It has a needle tip on it and you just squeeze. 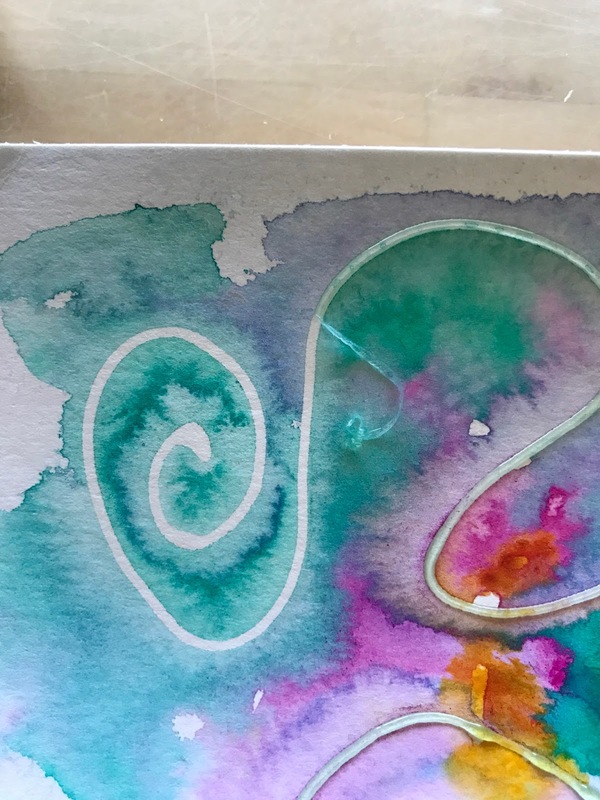 I used a piece of mixed media paper and made scrolls and loops using the resist pen. Then I put it somewhere safe from Aurora to dry overnight. The next day, I used a small watercolor set also from Prima and watercolored my paper. 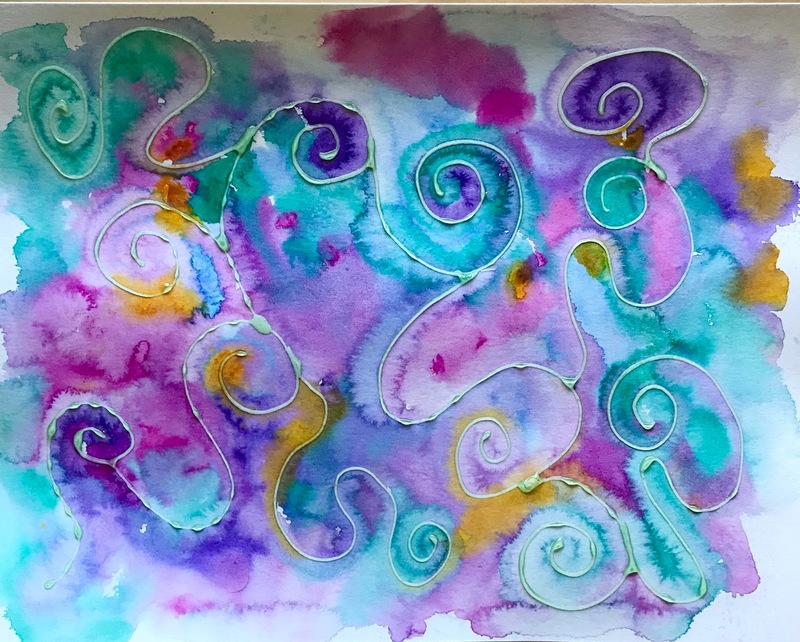 I slopped on a lot of water to start with – then added the color. It was cool to watch how the color moved to the borders of the resist and sat there. I was curious about the amount of water I added. I really thought it would seep under the edges of the resist lines. Here is what it looked like dry. I did not use a heat gun to dry this. I wasn’t sure how the resist would react with the heat, so I just stuck it back in the safe spot and waited. I really love how the colors mixed with each other. Notice – when the color bumped up to the resist lines, as it dried the resist pushed the color back in on itself. And made those cool little wiggly edges all around. I love it! Yesterday, I started peeling off the resist. It pulled up in a little rubbery strip, kind of like rubber cement did when we were kids. Notice that the color did not seep under the resist like I thought it might. It left a good crisp, clear line. And the white line left behind looks exactly like the resist line did. All the little blobs and blunders I made – not thinking ahead of time where I wanted to go – all still show up. But that’s ok. I like it! Next, I will take this sheet and start tangling it up! Resist and frisket are the same things. And I truly believe rubber cement would do the same thing. Just remember with it – the fumes are killer for headaches. We don’t even have any in our house just for that very reason. Just have fun and play some today.